A tradition of several centuries standing was maintained at Moycullen on Tuesday 8th Dec. the Feast of the Immaculate Conception and the opening of the Marian Year, when His Lordship Most Rev. Dr. Browne, Bishop of Galway solemnly dedicated the new Parish Church to Our Lady of the Immaculate Conception. 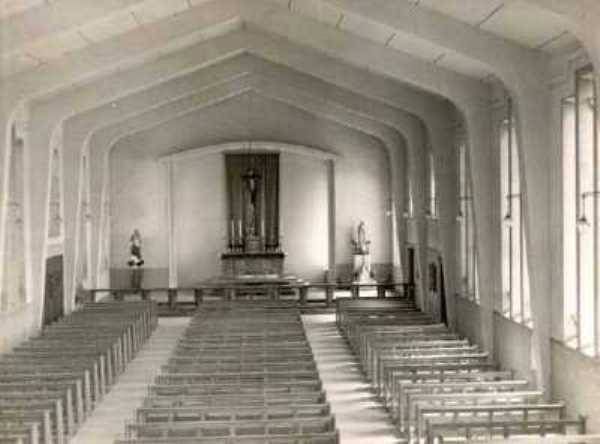 His Lordship pointed out that Roderick O’Flaherty the famous Irish scholar had recorded that as far back as 1680, Moycullen Church had been dedicated to the Immaculate Conception, which meant it must be one of the first so dedicated in Ireland. The Village of Moycullen was decorated with bunting, papal and national flags while altars to Our Lady were in the windows of many houses. His Lordship celebrated Pontifical High Mass; Right Rev. Dean M. Fallon P.P. Gort was assistant Priest, Very Rev. M McDonagh President of St Mary’s College, a native of the Parish, was deacon. Other priests assisted including Canters Very Rev. M. D. Higgins Adm. Moycullen and Rev. Val Fitzgerald, who returned recently from the States after a tour collecting funds for the new church. When His Lordship arrived at the Church he inspected a guard of honour of the F.C.A. under Commandant S. O’Connor O/C FCA West Galway and Lieut. J Clancy Moycullen. Addressing the huge congregation at the Mass, His Lordship said that the new church was necessary, as the old church had become dilapidated and unworthy of God’s service. It was a special joy that the work had been completed in time to dedicate it on the Feast of the Immaculate Conception — the day our Holy Father inaugurates the Marian year. It was a beautiful church, one that any parish in any city might be proud of. It was a wonderful achievement for the people of the parish, which was not richly endowed with fertile land as other parts of the country. For many years the collection of funds begun by Fr. O’Dea was continued and the vast majority of the people contributed week by week most generously, and between the collections and the functions organised by Fr Higgins and Fr. 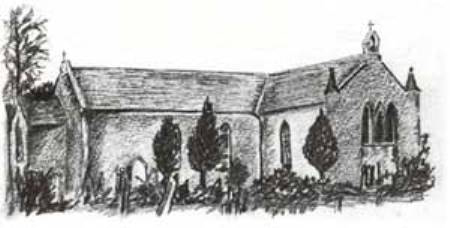 O’Dea, a total of almost £9,000 had been contributed by the parish. Through the indefatigable exertion of Fr. Fitzgerald and the generosity of the exiles, £8700 had come from the United States. The cost of the new church is over £20,000. The strikingly simple altar and communion rails are of Connemara marble. The vestibules are mosaic tiled and the cruciform window behind the alter portrays Our Lady, St. Patrick, St Colmcille and St. Brigid. The building is 126 feet long and 40 feet wide and very handsomely finished. Two choirs of children drawn from Newtown, Moycullen, Tullokyne, Loughwell and Tooreeney schools rendered the sacred music. Mr. Walsh and Mrs. M. J. Higgins conducted the choirs. While groups of volunteer workers from the village were preparing the church on Monday night for the ceremonies, the electrical lighting system failed. Cars were brought to the doorway and work was completed in the light thrown by headlamps.